IKEA kitchen quality - Good experience? 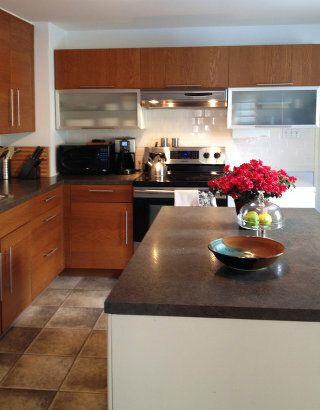 Pro and Con review from kitchen installers. Having designed and installed many Ikea and non-ikea kitchens, we have compiled a list of pros and cons so you can know a bit more of what you’re committing to. Get it now. In stock cabinets eliminate the typical four-to-six-week wait, and allow you to replace damaged or misordered pieces without a delay. Expect quality hardware. Full extension soft-close drawer slides and adjustable hinges come as standard with Ikea. Organize. Ikea has a decent selection of interior organizers like spice inserts, lazy susans, etc. with the option of adding more from a third party supplier like Lee Valley or Richelieu. Save. Thousands of dollars can be saved by assembling and installing yourself (if you have the skill, time, and ambition). Splurge elsewhere. Lower cost of cabinets might mean you can splurge on counters and tile! Expect design limitations. Ikea has a smaller selection of door styles, wood species, wood stains, and thermofoil colours. Accept space challenges. There’s no 33” wide cabinet. If a 36” is a bit too big, you have to go with 30” and have a huge filler strip, which is unsightly and a waste of space. Know your hidden costs. The advertised price does not include delivery, assembly, and installation (add in another $1800 to $2500 for the average kitchen, or sacrifice your own time, talent, and energy). Pay attention to key details. 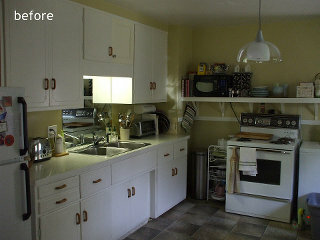 The melamine cabinet boxes don’t match the doors (unless you go white or natural birch). This means you can’t get an open shelf or glass-door cabinet with a wood-veneer or colored interior to match. This is a huge deterrent in using open shelves and clear glass. Forget about trim and extras. Crown moulding anyone? Ikea’s trim pieces are almost non-existent. While this may be ok for modern minimalism, don’t try to design a chunky island with turned posts, baseboard trim, and bar brackets.